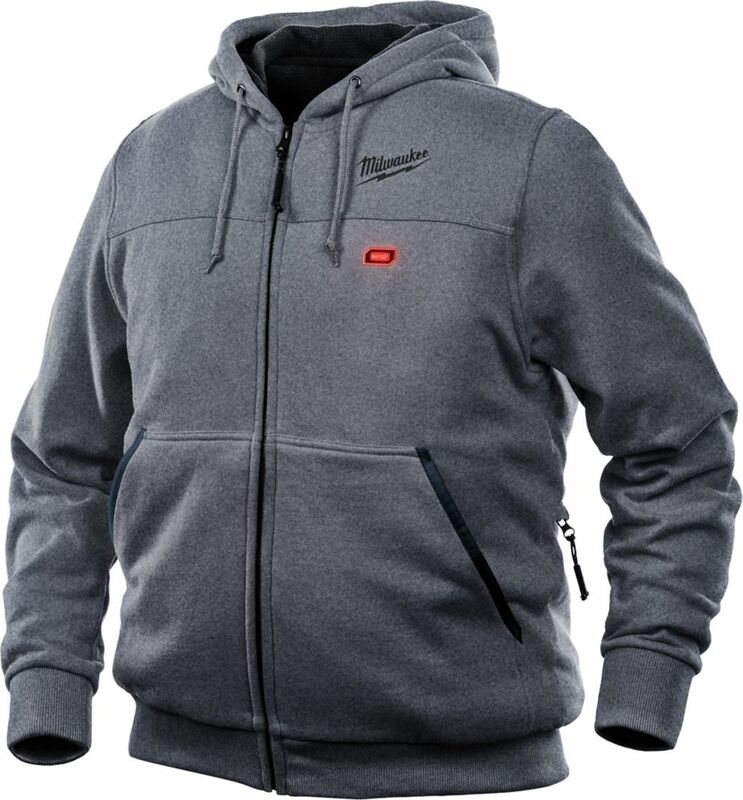 Men's Medium M12 12-Volt Lithium-Ion Cordless Gray Heated Hoodie (Tool Only) The medium gray heated hoodie is powered by the M12 REDLITHIUM battery. Each heated hoodie uses carbon fiber heating elements to create and distribute heat to the chest and back. A single touch LED controller heats up the battery heated hoodie to three heat settings. This MILWAUKEE heated hoodie kit has a new Quick-Heat funtion that allows you to feel heat three times faster than our previous hoodies and market competitors. The hooded sweatshirts are built with a durable cotton/polyester exterior and waffle weave thermal lining. This provides a versatile three-season solution to keep heat trapped in without bulky additional layers. Men's Medium M12 12-Volt Lithium-Ion Cordless Gray Heated Hoodie (Tool Only) is rated 3.7 out of 5 by 10. Rated 2 out of 5 by Aaron from Yes the jacket is made well in terms of quality and yes it does get nice and warm, but the batter... Yes the jacket is made well in terms of quality and yes it does get nice and warm, but the battery pack sits in such a weird location that it puts weight on one side of your body and sticks out about half a foot, I'm sure if anyone is buying this jacket it's to work outside in just as I do, but that quickly becomes impossible unless you are standing in one place, not moving. Rated 2 out of 5 by Pengy from I was not impressed with this hoodie. The fabric is... I was not impressed with this hoodie. The fabric is very thin with the arms being particularly breezy. The heating element does work well. For my uses I found the heated Axis vest to be a much better choice. Much more versatile with the same heating elements as the hoodie. Rated 5 out of 5 by Nerually from Keep you nice and toasty! Wear it all day at work where the temperature is usually only 10-15c. Battery usually lasts 2 hours on high. If you use it everyday it Only lasts about two seasons and burns out. Rated 4 out of 5 by JT from Love the product. Was missing battery. ... Love the product. Was missing battery. Rated 5 out of 5 by Arsenal from Excellent Quality Hoodie, Very Warm I am 5'10, 165 lbs, the medium fits perfectly. This is a well made hoodie. I own a lot of hoodies, over 30 in my wardrobe and this is one of my favorites. I was deciding between the hoodie or jacket and I think the hoodie is a better choice because in order to get the most out of the heated function, you need the garment as close to your body as possible. Usually with a jacket you would wear something underneath, like a hoodie or sweater so there is an extra layer of clothing that is blocking the heat. On the other hand, with a hoodie one usually wears a t-shirt underneath, so the hoodie is much closer to your body and you would feel the heat more directly. I'd recommend this product to anyone who wants a warm winter hoodie. I am not a construction worker. I am a weekend DIY type of guy and I bought this to keep me warm during the winter when I walk outside. So far, for the past few days where temperature is around -2 at night it has been doing a great job. When I hop into my car in the morning I don't even need to turn on the heated seat function in my car because I have this hoodie. Overall, this is an excellent product IMO, it is high quality and the heated function works as expected. There is one small downside, the battery is a bit big and a bit heavy with the hoodie. If Milwaukee can develop a smaller version of the battery for this product, this would be perfect. One final comment, if you plan to buy this hoodie or the jacket, get it without the battery, which is about $50 bucks cheaper. Then you can get the M12 screwdriver 2401-22, which comes with two M12 batteries and there is a promo now with an additional 3Ah battery. The screwdriver is $99 bucks. So for $49 dollars, you are getting an extra screwdriver and 2 extra batteries which is an excellent deal. If you time it with the HD promo using their credit card, you can get additional 10% off.